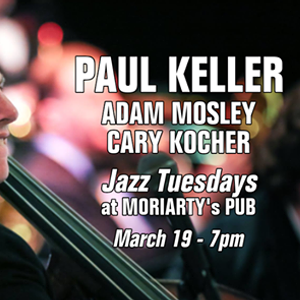 Jazz Tuesdays is a weekly event featuring great jazz musicians from all over the state of Michigan, and across the country. Each week brings in a different guest artist and a new experience. Jazz string bassist Paul Keller wears many hats: He is a well-respected master of his instrument; he is a prolific composer and an outstanding arranger of music for small and large ensembles; he is an educator, an entertainer and impresario; he is a lover of, a student of, and a proponent of The Great American Songbook; he is a successful bandleader of several different groups and he is an in-demand sideman who has performed all over the world with a myriad of jazz luminaries. Paul has earned the nick-name "The House Bass Player For The State Of Michigan" as each year, he logs so many miles traveling across the state to perform at various music venues. 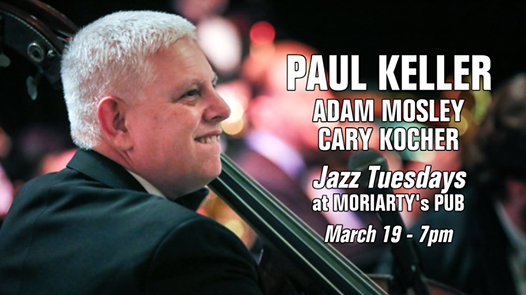 Paul is joined at this show by master vibraphonist Cary Kocher, pianist Adam Mosley, and Jazz Tuesdays host Jeff Shoup on drums. The host band will play the first set at 7pm, followed by a jam session until 10. Jazz Tuesdays is generously sponsored by Gregg Hill Publishing, the East Lansing Summer Solstice Jazz Festival, and INDe Drum Lab.